1 April 1904: One-Year Volunteer in I. See-Bataillon, Kiel. 1 April 1905: Entered the Royal Saxon 12. Infanterie-Regiment Nr. 177 with the prospect of promotion. 21 November 1908-2 December 1908: Detached for training in the business of weapons overhaul at the Dresden Munitions Factory. 1 March 1909-31 July 1909: Detached to the Military Riding Institute, Berlin. 1 April 1909: Detached to the service of the Saxon Cadet Corps in Dresden. 24 March 1912: Adjutant of the Saxon Cadet Corps in Dresden. 1 April 1912: Transferred to the Saxon Cadet Corps in Dresden while retaining his position as Adjutant. 3 August 1914: Regimental Adjutant of the Royal Saxon 4. Infanterie-Regiment Nr.103. 4 October 1914: Leader of the II. Battalion of Infantry Regiment 103. 9 October 1914: Again, Regimental Adjutant of Infantry Regiment 103. 14 October 1915: Sick/in hospital. 22 October 1915: Company Leader in Infantry Regiment 103. 22 April 1916: Sick, transferred to Reserve Medical Company 1. 4 June 1916: Again, Company Leader in Infantry Regiment 103. 6 July 1916: Adjutant on the staff of Division Fortmüller. 15 July 1916: Delegated with the leadership of the III. Battalion of Infantry Regiment 103. 18 August 1916: Adjutant of the 48th Reserve Infantry Brigade. 1 October 1917: Officer of the Army and detached for training in General Staff service with the 32nd Infantry Division. 10 March 1918: Detached to the staff of the Artillery Commander of the 32nd Infantry Division. 17 March 1918: Detached to the 7th Battery of the Royal Saxon 5. Feld-Artillerie-Regiment Nr. 64. 7 April 1918: Detached to Foot Artillery Battalion 80. 28 April 1918: Transferred for further General Staff training to the General Command of XIX Army Corps. 30 May 1918-26 June 1918: Detached to the General Staff course in Sedan. 1 September 1918: Transferred to the General Staff of the Royal Saxon Army while retaining his post with the General Command of XIX Army Corps. 15 October 1918: Second General Staff Officer of the 24th Infantry Division. 15 January 1919: Company Leader in Infantry Regiment 177. 2 March 1919: General Staff Officer in the General Command of XII Army Corps. 1 April 1919: General Staff Officer in Wehrkreis [Military District] Command IV and, at the same time, detached to the Processing Establishment of the XII Army Corps. 1 May 1920: Hauptmann on the Staff of the I. Battalion of Reichswehr Infantry Regiment 23. 1 May 1920-2 June 1920: At the same time, detached to the staff of Reichswehr-Brigade 16. 25 September 1920-31 December 1920: At the same time, detached to the staff of Reichswehr-Brigade 4. 1 January 1921: Hauptmann on the Staff of the III. Battalion of Infantry Regiment 10. 1 October 1921: Transferred to the regimental staff of the 10th (Saxon) Infantry Regiment. 1 March 1922: Company Chief in the 10th (Saxon) Infantry Regiment. 20 March 1923: Detached to the Reich War Ministry. 1 October 1926: Transferred to the General Staff of Group Command 1. 1 October 1927: Transferred to the General Staff of the 4th Division. 19 February 1928-26 February 1928: Detached to the Artillery Course for Non-Artillerists in Jüterbog. 1 October 1931: Commander of the II. Battalion of the 3rd (Prussian) Infantry Regiment. 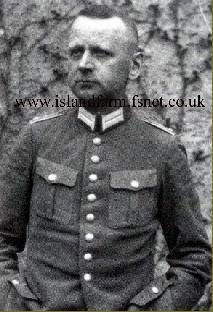 15 October 1935: Commander of Infantry Regiment 45 of the 21st Infantry Division. 1 June 1937: Commander of Army Service Center 2. 10 November 1938: Commander of Army Service Center 6. 1 May 1939: Landwehr (“Territorial Forces”) Commander of Darmstadt. 13 December 1941: Army High Command Leader Reserve. 29 December 1941: Commandant of Smolensk, Russia. 10 July 1942: Army High Command Leader Reserve – sick. 23 January 1945: Commander of Division “Denecke” on the Eastern Front under Army Group Weichsal [Vistula] in Pomerania. 2 February 1945: Army High Command Leader Reserve. 10 March 1945-2 May 1945: Commandant of the Army Rear Area of the 3rd Panzer Army (General der Panzertruppe Hasso Freiherr von Manteuffel) on the Eastern Front. 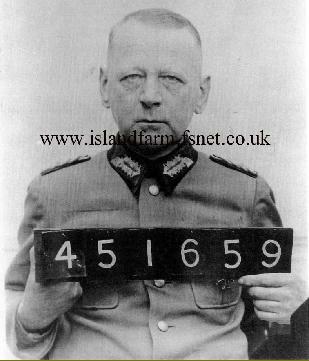 2 May 1945-15 October 1947: Prisoner of war in British captivity. 10th October 1947 transferred to Hamburg onboard the ship "El Nil"
Saxon Military St. Henry Order, Knight’s Cross: 28 August 1917. NOTE: Generalleutnant Denecke’s World War II decorations, if any, are not known. However, he was not a recipient of any high decorations such as the Knight’s Cross of the Iron Cross, Knight’s Cross of the War Merit Cross with Swords, or the German Cross in Gold/Silver. 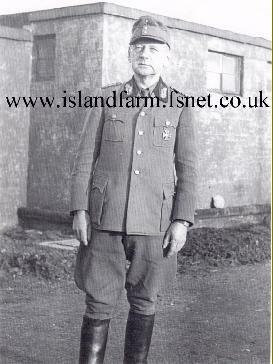 It is probable he received the 1939 Bars to his World War I Prussian Iron Crosses as well as the Medal for the Winter Campaign in Russia 1941/1942 (“East Medal”).